The Via Sacra (Latin: Via Sacra) (Sacred Road) was the main street of ancient Rome, leading from the top of the Capitoline Hill, through some of the most important religious sites of the Forum (where it is the widest street), to the Colosseum. The road was part of the traditional route of the Roman Triumph that began on the outskirts of the city and proceeded through the Roman Forum. In the 5th century BC, the road was supported by a substructure to protect it from the rain. Later it was paved and during the reign of Nero it was lined with colonnades. The road provided the setting for many deeds and misdeeds of Rome's history, the solemn religious festivals, the magnificent triumphs of victorious generals, and the daily throng assembling in the Basilicas to chat, throw dice, engage in business, or secure justice. Many prostitutes lined the street as well, looking for potential customers. Here's the our members favorite photos of "Famous Streets in Rome". 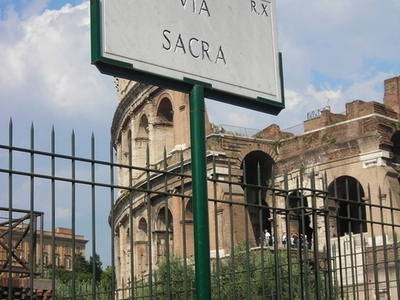 Upload your photo of Via Sacra!